May 9, 2014. 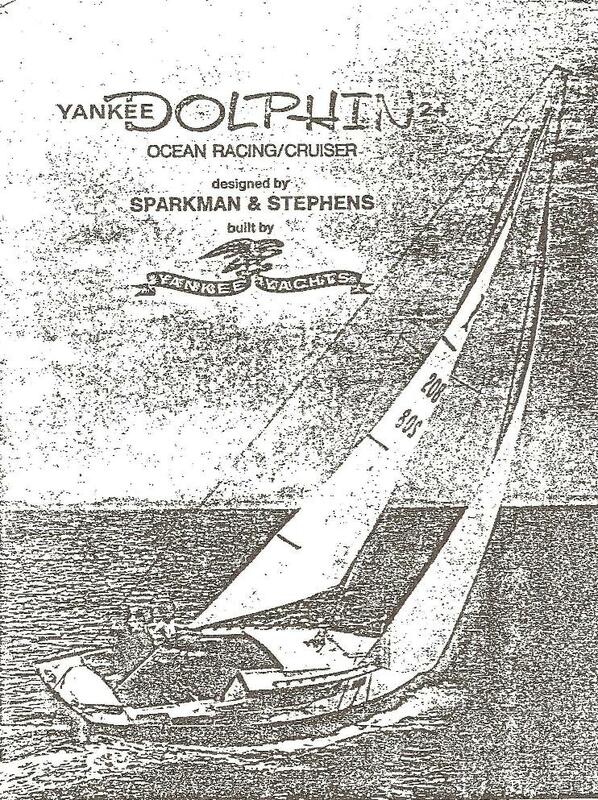 Jay Westbrook has checked as the new owner of Charisma, Yankee #208. Below is his email (edited). Click here to go to Charisma's prior life. I wanted to give you some good news. 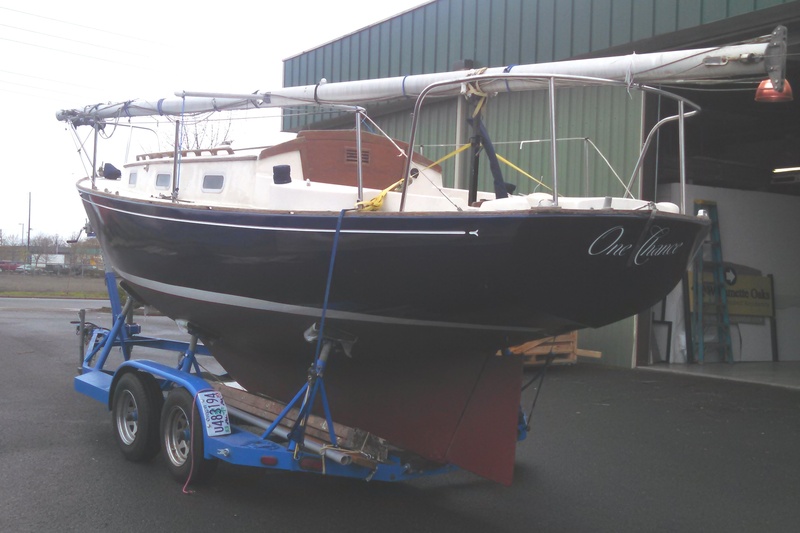 I just bought Charisma from Jeremy Covert this week, and we both just brought her up to Eugene to her new home. 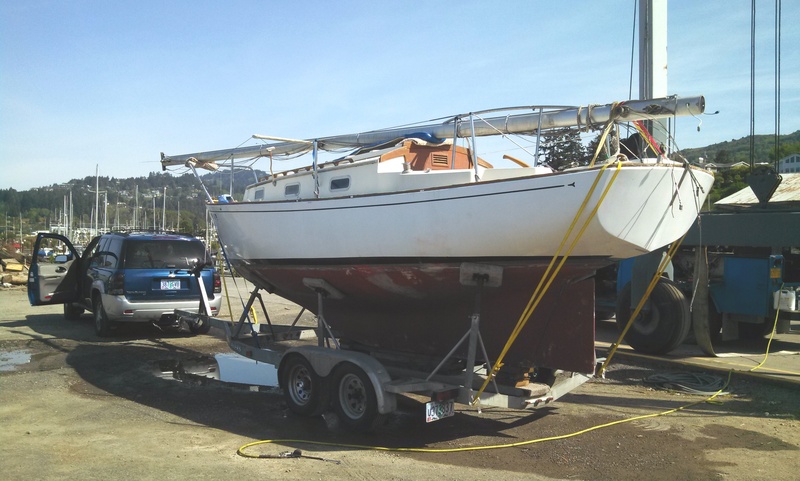 She will go into a slip tomorrow at Orchard Point Marina at Fern Ridge Reservoir. I had rented a trailer here in Eugene, and Jeremy flew into town and drove down to Brookings with me. The Brookings boat yard loaded her onto my trailer, dropped the mast for us, and then the next day we had a beautiful drive up to Eugene. Below are a couple of pictures from the trip. My plan is to get to know Charisma on the lake this season. I will work, as I can, to get her (and myself) ready for some coastal cruising, with eventual plans to cruise the Columbia River Gorge, the San Juan Islands, and off the coast of Washington and Oregon. 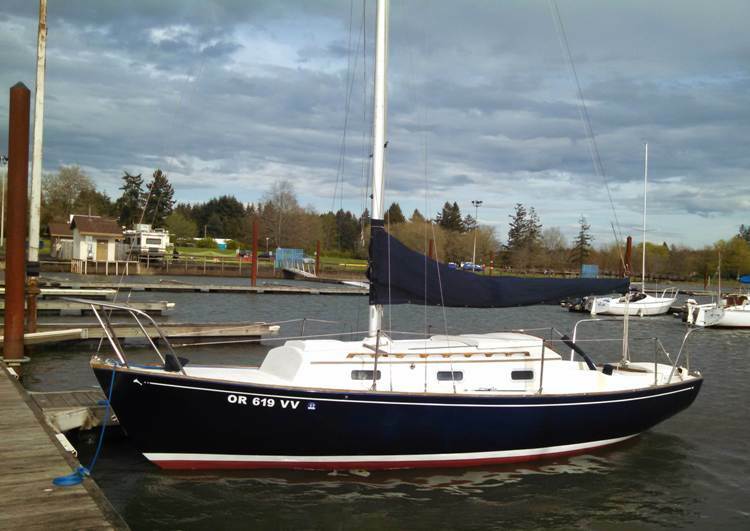 This is my first boat, but I am not looking to “start” with her and then “trade up.” Only a trailerable boat works for me, and so I expect Charisma to be my companion for a very long time. I hope to provide additional information as I go along, but wanted to get you this feedback right away. I know Jeremy plans to send you some updates as well. Jeremy and I had a great time together on our adventure, and I think we were both very pleased with the excursion. Just an update to give you a current picture of Charisma in her summer slot here in Eugene, Oregon. I noticed from your Whats New page that there is a second Charisma in Vermont. Made me wonder if you received any feedback from Ken Thompson (former owner of my Charisma) about the name history of 208? Even if he just has a name and number of a former owner, that would be great. Any help in tracking more history would be greatly appreciated! Thanks again, Ron, for helping get me this far! July 16, 2015. We got the following update from Jay (minor edit). Hope you are doing well also, and appreciate very much your dedication to keeping the Dolphin website available for all of us. Webmaster Note: So, where is this Fern Ridge Reservoir? We thought some would ask. I did. 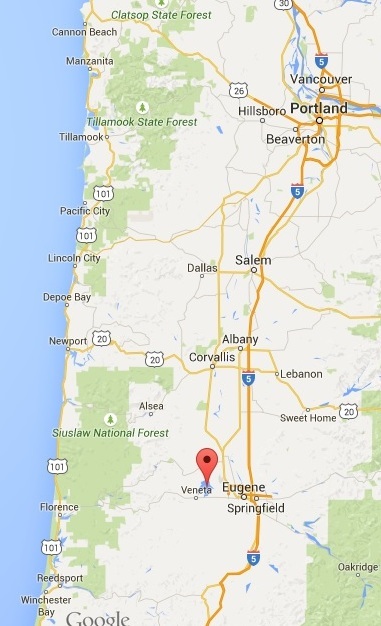 Wikipedia said it is about 4 1/2 miles long located about 40 miles inland from the Pacific coast, 12 miles west of Eugene, Oregon, and about 100 miles south of Portland. 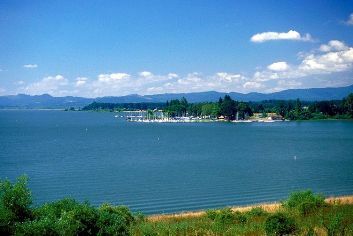 Below is a picture of the lake looking at the Eugene YC with the mountains in the background. 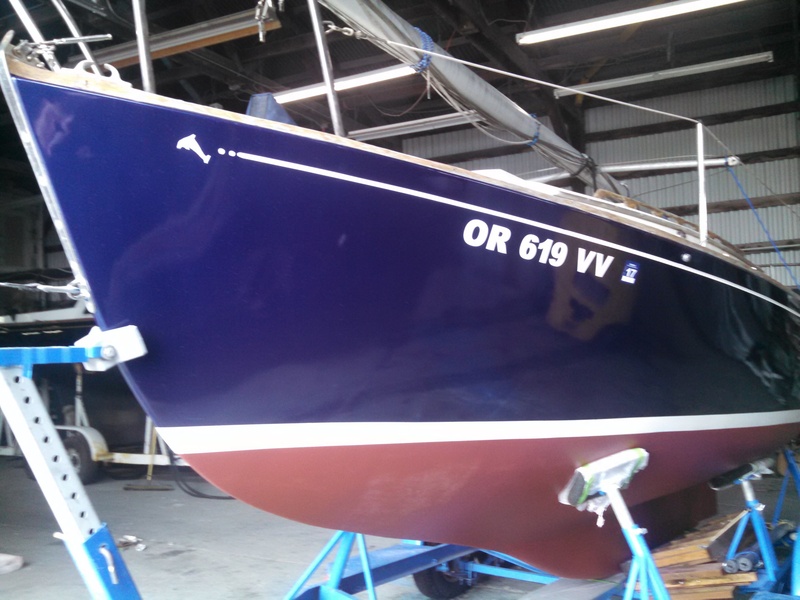 I am finally sending you a short update on my winter projects with Hull #208, formerly named Charisma. 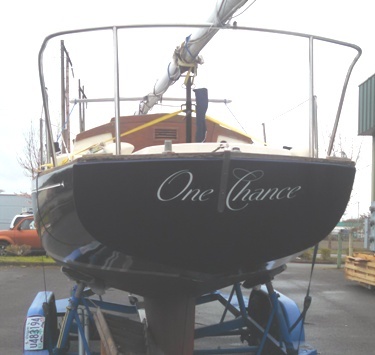 Yes, the first news is that she now has a new name, and that name is "One Chance." 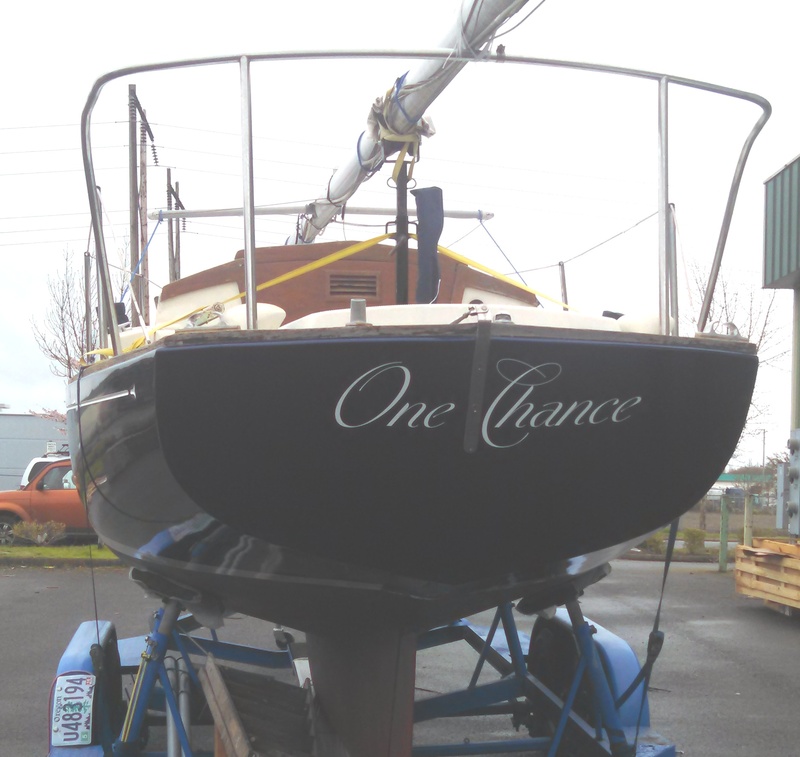 She also has a brand new paint job and the new name on her transom (see photos). Why the new name? Had I found that she had had the same name for a long time, or if I could have identified her original name, my sense of nostalgia would have led me to go with that name. But as you know, when I did my research and found out she had had several names in the last ten years, and that it was impossible to find the history further back, I chose to "go my own way." "Chance" is a family name with meaning for me, and I also wanted a name that was not very common. "One Chance" has a multitude of layers in its meaning, including the fact that, for me, buying a Dolphin two years ago was an initial leap of faith. It really was my "One Chance," and thankfully, I have never regretted it. During this winter, she also received a new digital depth sounder, and a new stern railing. Slowly but surely, I am getting her ready for a cruise away from her home lake. She needs to be in open water, and I am committed to making that happen. For now, she will be put into her marina slip on Fern Ridge Reservoir again very soon, perhaps this weekend. Making use of the technical articles on the Dolphin website, I have been experimenting with methods to raise and lower the mast without defaulting to the convenient Mast tower at the marina. I want to be able to launch her myself at many ports without such a convenience. In short, I am practicing with a homemade gin pole. When I the kinks worked out of my system, I will try to post some pictures and procedures. Thanks gain, Ron, for all of your hard work to keep the Dolphin owners connected. April 5, 2016. Jay has raised her mast and gave us a report with lots of pictures - and a couple of questions. Click here to go to the Technical Section/Mast raising and his report. Here's One Chance, ready to go. "One Chance now snug in her slip for the season"
So sorry for being incognito so long. I haven’t forgotten you and the Dolphin 24 group! Once Chance is in very good shape and getting better all the time. I still have not got her to the point of making a serious cruise, and given my work and travel schedule, not sure how realistic that might be in the short term. But in the meantime, I keep making improvements in her toward that end. There is probably more that I cannot remember at the moment, but you can rest assured this is one Dolphin that is getting some loving attention. 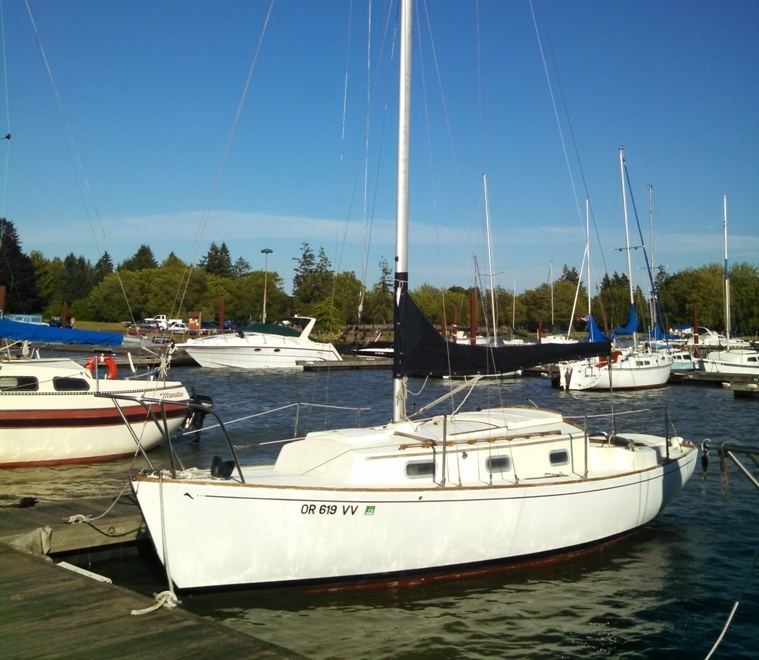 Before spring, I will also be running main and jib halyards to the cockpit with clutches and turning blocks (tired of going forward to raise and lower sails). I am also working to improve my mast-raising (lowering) system, by adding “baby-stays” to support the mast laterally during lifting. I have lifted it just fine with a gin pole, but want to make the system more foolproof. I have the new stays fabricated, and am planning to do a “test lift” on her trailer in a couple months to see how it works. I will try to take pictures and forward to you. 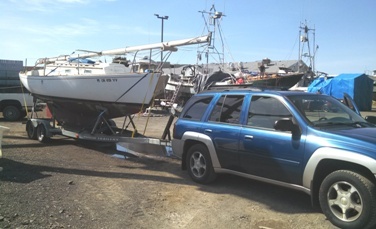 I want to good system that will allow me to raise that mast at any launch ramp, in any wind conditions, without worry. Thanks again, Ron, for your hard work on behalf of all of us, and will try to be in touch more as time allows.